Here’s one for all you do-gooder Cyber Monday shoppers out there. “Doing good” and online shopping have traditionally been at odds. You know what your favorite brands are, where to find them online, and maybe you occasionally find yourself wanting to patronize the green, “ethical” equivalent of your favorite brands. Problem is, you have no idea where to find them, and you probably don’t care that much. Plus, search results don’t give you the price points or styles you want. As to how it works? Fashioning Change lets shoppers select name brands, or filter based on certain products, at which point the recommendation engine serves eco-friendly and ethical alternatives, based on price point and style. 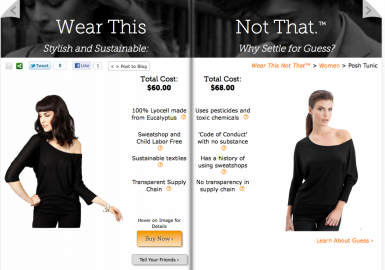 The site also features a product called “Wear This, Not That”, which juxtaposes a name brand with a “green” brand, so that users can directly compare the look and price of the product, as well as compare the practices used by each company to manufacture the product. Each of these comparisons are interactive, as customers are able to view pictures of the products and make purchases directly from the pages, as well as embed the looks on their own site. For “eco-friendly” brands, Fashioning Change wants to be a platform that creates brand awareness by way of association and comparison, as well as providing details behind what makes their practices more eco-friendly and ethical than a comparable product or name brand. And, as the startup grows, it hopes to provide these brands with a global market through which they can acquire new customers and reach shoppers that are looking for an alternative to name brands. The startup has built its recommendation engine using machine learning algorithms, so that as the platform grows, it takes activity and user preferences to fine-tune product-to-product recommendations, making for more accurate suggestions for individual shoppers. The startup was founded by Adriana Herrera and Kevin Ball. Herrera is a graduate of the San Diego Founders Institute, and Ball was one of the first five engineers at Causes.com. As to the company’s Firefox add-on, the browser tool allows shoppers to receive realtime recommendations as they shop directly from 30 of the top name brand sites. 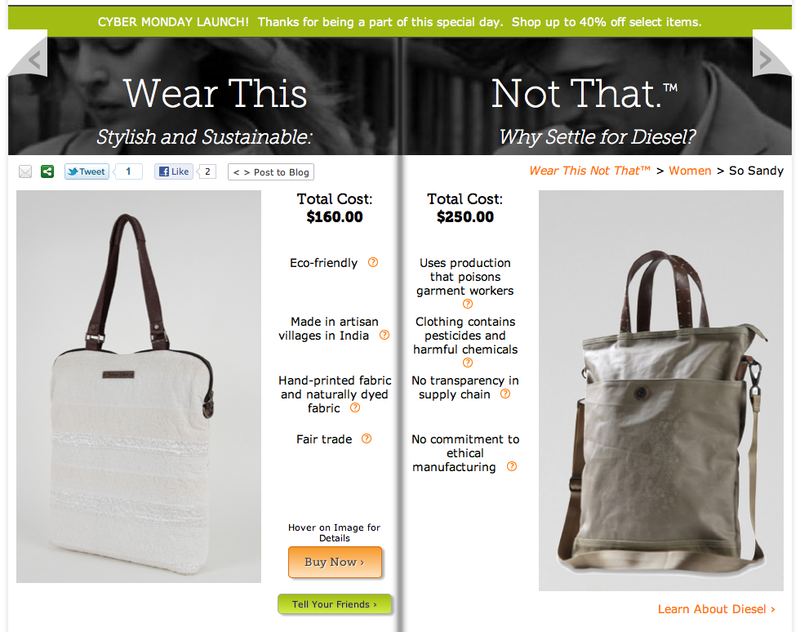 And, like its web counterpart, the add-on provides access to the ethical practices used by the name brands whose sites users are surfing to compare with more eco-friendly products. For readers looking to test out Fashioning Change’s Mozilla add-on, navigate over to the startup’s website here. The first 100 readers can use the “TechCrunch” access code to receive a free test run. Then report back and let us know what you think.